Cricket is a batsman’s game. From our broadcasting box you can’t see any grass at all. It is simply a carpet of humanity. Captaincy is 90 per cent luck and 10 per cent skill. But don’t try it without that 10 per cent. But I think the only thing that annoys me about that is if I suddenly find someone on commercial radio or something like that, mimicking my voice or actions and trying to promote a product and pretending it’s me doing it. My mantra is: put your brain into gear and if you can add to what’s on the screen then do it, otherwise shut up. The slow-motion replay doesn’t show how fast the ball was really travelling. 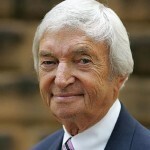 Richard "Richie" Benaud OBE is a former Australian cricketer who, since his retirement from international cricket in 1964, has become a highly regarded commentator on the game.